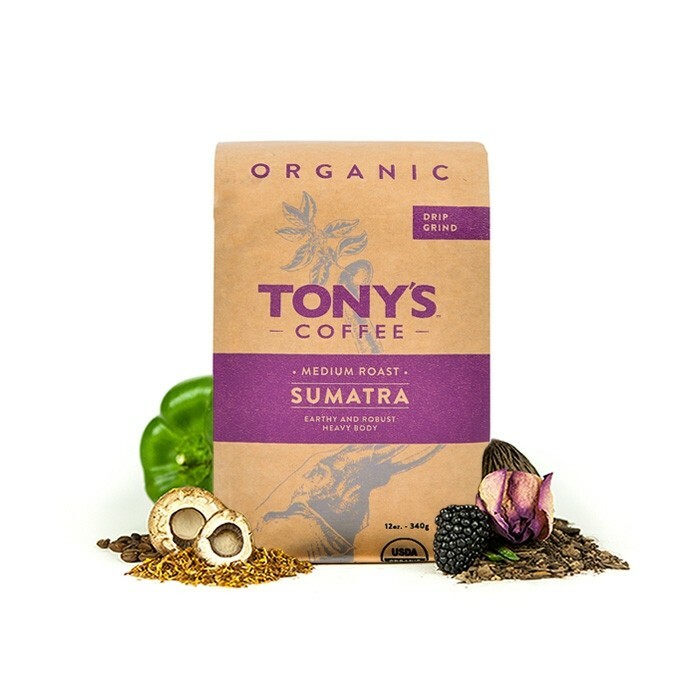 This is the Sumatra GLOC Cooperative Fair Trade & Organic brought to you by Tony's Coffee. This wet hulled coffee was grown in the Gayo Highlands, Aceh region of Sumatra and is Fair Trade and Organic certified. The cup is perfect for fans of classic Sumatra profile fans, with deep earthy, spice and tobacco notes. Loved it. Probably favorite yet! This one tastes slightly more bitter than the last. Looking forward to the Peru beans that are on their way! We switched from a hand grinder to an electric burr grinder over the course of this coffee, so it was a little rocky to start, but we find that the earthiness of this interacts quite well with the moka pot that is our primary brewing method. This was so dark!! Really do not like it. Classic Sumatra minus the bold flavor and the nutty finish. Finish just drops off. Not for me. Deep, rich aroma. Complex flavor - I savored every cup. I didn't pick up a "tobacco" note though. No words. It's got everything you need for a great cup of coffee. The subtle hints of spices make this coffee even more exceptional. Over time, I have come to find out that I really do not like Sumatras. However, I will say that this may have been the best Sumatra I have had to date. Most others, I find, are roasted to dark, which pulls away any chance of flavor complexity or acidity. Tony's Sumatra was only roasted medium, so some more interesting notes had a chance to creep their way in. Not something I'd buy again, but it was fine as an experience. Prepared as french press. I'm really hoping for my next cup to by light roast and high acidity. Recently, I have found grapefruit to be one of my favorite flavors for coffee. Not my favorite. It has a flat taste and is too bitter.